In the midst of research for The Greenwich Village Bookshop Door exhibition, my former colleague Molly Schwartzburg alerted me to an unpublished manuscript she had located in the collection of writer and editor Christopher Morley (known today for his novel Parnassus on Wheels and his work on the editorial board of the Book-of-the-Month Club). The first page of “A Wild Plaint,” 1909. Christopher Morley Collection. The manuscript, A Wild Plaint, is in the form of a journal in two bound notebooks. It was submitted to the publisher Doubleday, Page & Co in 1909 accompanied by a note from “A. K. White,” explaining, “I found this mss. among the effects of Mr. Gray. Thinking that he may have intended it for publication, I send it to your esteemed house with my compliments.” Morley’s work as an editor at Doubleday, Page, likely accounts for the manuscript’s presence in his collection. 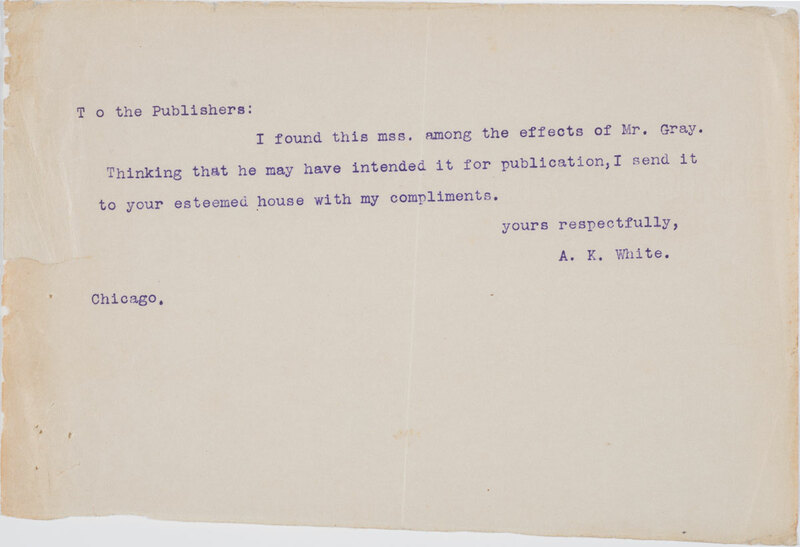 The typed note accompanying the manuscript of “A Wild Plaint,” 1909. Christopher Morley Collection. That Johnson submitted the manuscript to Doubleday, Page as the work of Aubrey Gray, suggests that he believed it would be more compelling if read as non-fiction. And yet Johnson’s identity is not completely obscured. The first indication of Johnson’s authorship appears on the flyleaf of the second notebook; though crossed out, his name is legible, “J. Fenton Johnson.” The handwriting of A Wild Plaint matches the distinctive handwriting of Fenton Johnson in manuscripts held by other repositories. 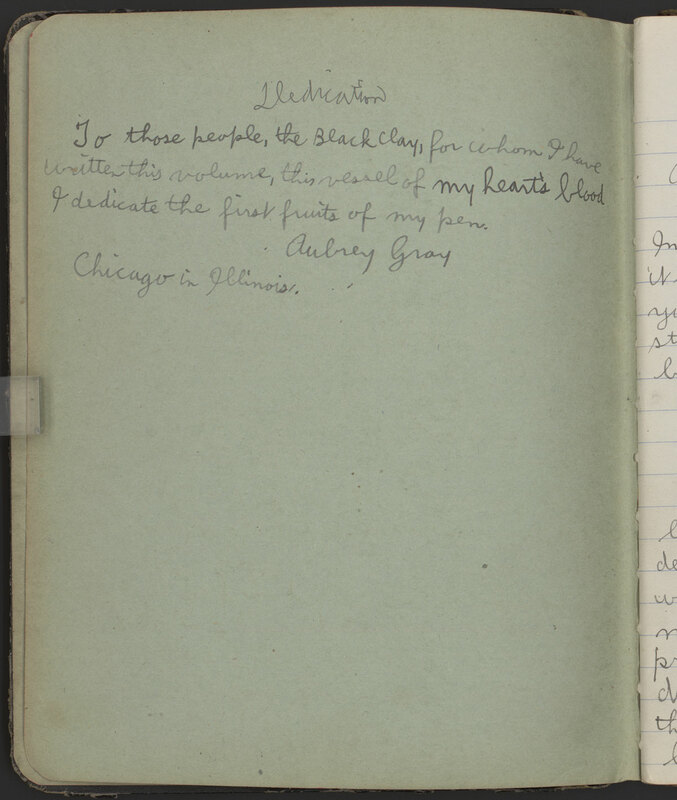 Similarities to Johnson’s published work and its setting in Johnson’s hometown of Chicago offer further confirmation of his authorship. The dedication, “A Wild Plaint,” 1909. Christopher Morley Collection. There is much for readers and scholars to discover in A Wild Plaint. It provides new context for understanding Fenton Johnson’s work. 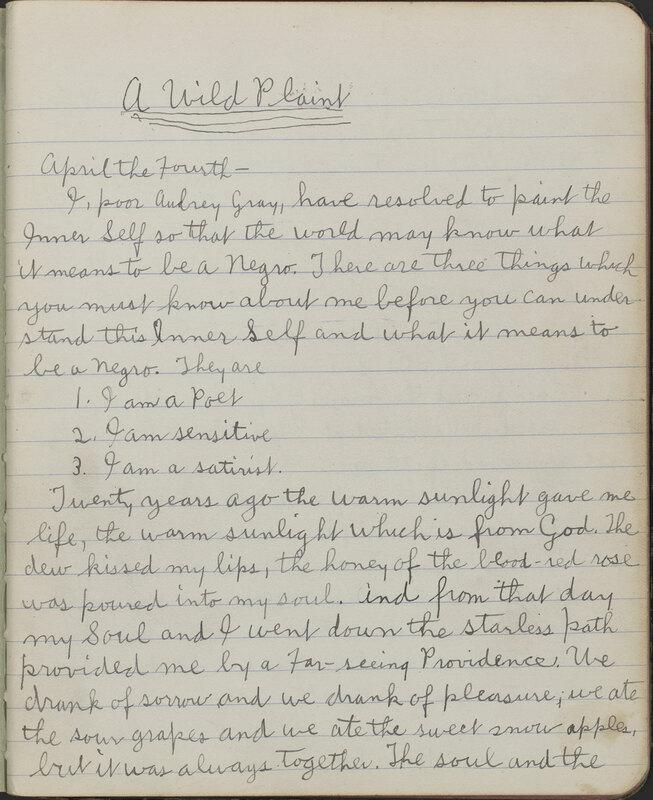 It contributes to the ongoing work of scholars who are excavating a rich corpus of African American fiction and nonfiction from a period in African American history that traditionally has been labeled the “Nadir.” The pages of Aubrey Gray’s journal show Johnson’s engagement with the 1903 W. E. B. Du Bois classic, The Souls of Black Folk, as Johnson works both with and against Du Bois’s book. It also offers a depiction of racial segregation and discrimination in a northern city and Johnson’s own constructions of race and nationality in the early twentieth century. 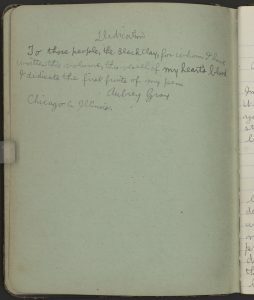 To foster teaching with and scholarship on A Wild Plaint, the manuscript and a transcript are now available through the Center’s digital collections portal. 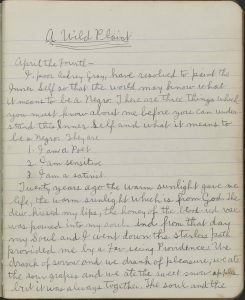 Read more about the significance of this addition to Johnson’s oeuvre and excerpts of A Wild Plaint in the Spring 2017 issue of African American Review.